FORT HOOD, Texas -- Increased dwell time and predictability are coming, Sgt. Maj. of the Army Kenneth Preston told approximately 500 Soldiers here Friday at Club Hood. He also provided an update about new uniforms, Comprehensive Soldier Fitness, new physical training requirements and what is to come in the Army. "I've got some stuff to pass along to you," Preston said. "I want you to share this with your Soldiers." The most-frequent questions Preston gets when he meets with Soldiers involve dwell time and predictability. Both topics are a work in progress as Iraq deployments wind down and the focus has turned to Operation Enduring Freedom. "Our current demands outweigh our ability to restore readiness and strategic flexibility and sustain an all-volunteer force," Preston said. The Army had to grow quickly to meet the demand for two ongoing conflicts, but it looks as though demand and troop strength are beginning to level out. Currently dwell time for active-component Soldiers in the Army is one year deployed and one year at home. Reserve-component Soldiers have an average of one year deployed and four years at home. Preston said he expects to see dwell time extended for active-duty troops to one year deployed, two years at home. "Dwell time is increasing," he said. If the Army can get down to 10 brigade combat teams, he added, that time could extend to nine months deployed and three years at home, but the 1:2 ratio is one the horizon. Extended dwell time will give Soldiers and their families more predictability, Preston said, adding that in the long-term, leaders want to see Soldiers stay in place five or six years. "When we develop you, we make you a better Soldier," he said. The former 3rd Brigade Combat Team, 1st Cavalry Division command sergeant major reiterated Chief of Staff of the Army Gen. George W. Casey Jr.'s four strategic imperatives: sustain, prepare, reset and transform. Soldiers and families must be sustained and provided the best care possible. Initiatives such as the Army Family Covenant and Army Community Covenant have provided launch points for improved quality of life for Soldiers and their families by opening child development centers, privatizing housing and the First Sergeants' Barracks Program. "Soldiers and their families are the heart of soul of the force," Preston said. In this era of persistent conflict, that sustainment must carry Soldiers and their families as they prepare for current conflicts, and reset to restore returning units to a level of readiness necessary for future missions. "We need to balance current and future demands with readiness and sustainability," Preston said. All of this must occur while the Army is completing its transformation, "a continuous process that sets conditions for success against near and future enemies." Transformation of the Army started in 2004, the largest transformation of the force since World War II. The process is about 90 percent complete, Preston said. "We want to be a modular, plug-and-play Army," he said. "This involves a re-balancing of the force." Under the transformation, 160,000 active-duty and reserve-component Soldiers have transitioned to other military occupational specialties. With more Soldiers in garrison, the Base Realignment and Closure complete and modularity almost complete, Soldiers will be getting more predictability in their lives. Through the current conflicts and ever-changing Army of today, leaders continue to look toward the future and use lessons learned for the Army of tomorrow. "We are continually looking at ways to make it better for the next Soldier," Preston said. "I want Soldiers to lead the way for the future." One thing that needs to improve is physical fitness of Soldiers, and Preston said the new Physical Readiness Training guidelines will help build up what he called "deteriorated standards." With 54 percent of males and 43 percent of females entering the Army with a body mass index of more than 25 percent, Preston is concerned about overweight Soldiers and urged the Soldiers to get involved. "I need your help," he said. "Get into the PRT." Preston wants Soldiers to be fit not only in body, but in the five dimensions of the Comprehensive Soldier Fitness plan. Unveiled last year by Casey, CSF promotes health and strength in mind, body, spirit, family and social aspects for Soldiers, families and Army civilians. "When faced with adversity, we want Soldiers to take on that adversity and come out stronger," Preston said. There are four pillars under which the Army works to achieve comprehensive health in the ranks. The online Global Assessment Tool is a confidential road map to help Soldiers and families identify their strengths and weaknesses. Comprehensive Resilience Models are confidential tools used to strengthen identified weaknesses and build resilience through training that is tailored to the individual. Master Resilience Trainers have received training and are utilized at the unit level as subject-matter experts about comprehensive fitness where they teach and develop initiatives. "They are the core of Comprehensive Soldier Fitness," Preston said. "We must get this right." 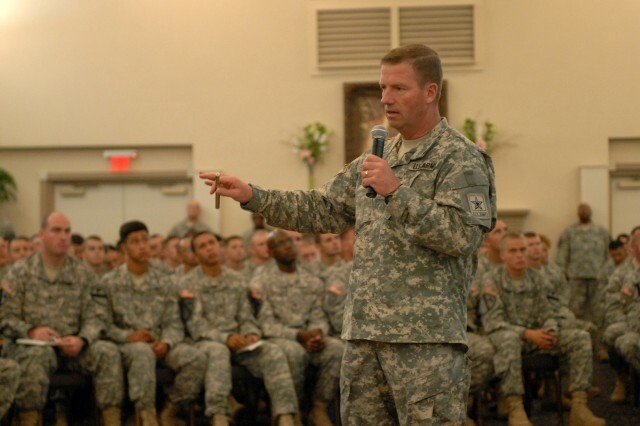 As of Aug. 13, there are 1,633 Master Resilience Trainers in the Army, Preston said. The target before the end of the year is 1,800. The fourth pillar is professional military education, which institutionalizes the master resilience trainer program and is tailored to the Soldier's level of responsibility. At Fort Hood, the physical manifestation of the CSF is the resiliency campus. Preston called Fort Hood's resiliency campus an example of a best practice and part of something we need to standardize across the Army. "There are a lot of best practices here at Fort Hood," he said. "If we can extend those to other installations, we all benefit from that growth." Time-management skills are one thing Preston would like to see institutionalized. "All the things we are asking of Soldiers, how to make all the pieces fit," Preston said. The Sergeant Major of the Army said he enjoyed the chance to meet with troops and share information that he hopes they will, in turn, share with their fellow troops. Sgt. Dan Malone, a crew chief assigned to 3rd Battalion, 227th Aviation Regiment, 1st Air Cavalry Brigade, 1st Cavalry Division, said the update was informative and he was honored to be a part of Preston's visit. New uniforms, the multicam OEF Camouflage Pattern that is being issued in Afghanistan, and the new PRT are what Malone will take to his Soldiers. "I like the focus on whole Soldier training," Malone said. "I think it will make each Soldier stronger." Malone said he was happy to learn that air crews also will be receiving the new fire-retardant uniforms. Command Sgt. Maj. Rory Malloy, the 1st Cavalry Division's top NCO, said Preston's visit meant a lot to the Soldiers and was a good look at the road ahead. "All the slides apply to all ranks," Malloy said. "This really gives us a look at five to ten years to come." The visit was a continuation of Soldier development and training, he added. "Now they have a responsibility to take the information to the ranks," Malloy said. "All ranks there are now charged with spreading the message."